Ohio dealer Bob McDorman, 78, plans to train and mentor dealership managers who want to become dealers. Bob McDorman has had a lifelong love affair with cars. As a youngster he was fascinated with the door handles and radio knobs of the family car. He rebuilt cars right out of high school. As an adult, he became a seller and collector. Now the owner of Bob McDorman Chevrolet in suburban Columbus, Ohio, is getting ready to share the love -- and maybe even his dealership. McDorman says he will retire in five years. His exit strategy includes training and mentoring dealership managers who want to become dealers. He plans to allow candidates to work at his store as a general manager and set aside a percentage of their earnings to buy either their own dealership or a stake in McDorman Chevrolet. McDorman's children won't be taking over his dealership. So he wants to help other dealership managers with a passion for the business to realize their dreams. "I've been a Chevrolet dealer 45 years. I'm going to keep at it five more years," McDorman, who still works six days a week, told Automotive News. "Fifty years is a good enough story for me to tell. I want to help guys get their own." 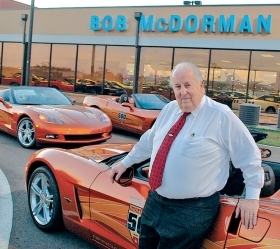 McDorman Chevrolet sold about 1,200 new vehicles and 1,200 used vehicles in 2009. His 2010 sales were on track to rise about 10 percent, and new-vehicle sales will be flat. McDorman says the ideal candidates for his training program have extensive dealership management experience, a passion for the auto industry, money to invest and are honest and hard-working. He hopes his candidates will be able to buy their own store or a stake in McDorman Chevrolet in three to five years. Marc Hellman, who McDorman hired in December as his general manager, seems to fit the bill. Hellman has been in the car business for more than 30 years, most recently as a general manager at a Columbus-area Chevrolet store. He wants to become a dealer, and McDorman's plan to retire in five years works well for him.